Every year the High School celebrates our district's diversity with a Cultural Arts Assembly. In 2016 students enjoyed an amazing performance by Flame the Band. 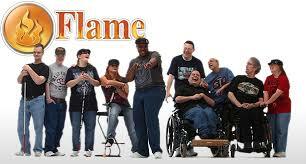 Flame is a group of talented musicians from upstate New York, who just happen to have disabilities, including ​blindness, autism, cerebral palsy and down syndrome. The band has looked way past their disabilities and bring Flame’s music and message to the rest of the world to help change how the public perceives people with disabilities and increase the awareness and acceptance of all people.